Day One bolted off to a good start for the The Durban University of Technology (DUT) which is hosting the Project on Energy Efficiency in Southern Africa (PEESA) III Meeting at the Steve Biko Campus, S Block, from 22 to 25 January 2019. Various local and international academic delegates are in attendance to focus on engineering education and achieving EUR-ACE accreditation of the joint Masters qualifications, as well as supporting and promoting gender equity in engineering programmes. South African and European representatives from the Durban University of Technology – DUT, Cape Peninsula University of Technology CPUT, Tshwane University of Technology – TUT, Vaal University of Technology – VUT, Hochschule Wismar University of Applied Sciences (Germany) – HSW, Hochschule Flensburg University of Applied Sciences (Germany) – HSFL, Uniwersytet Szczecinski (Poland) – USZ and Universitatea Lucian Blaga Din Sibiu (Romania) – ULBS, are at the event. Welcoming the academic guests to DUT was DVC: Research, Innovation and Engagement Professor Sibusiso Moyo, who reiterated the importance of local and international partnerships and forming colloborations. “ As you (academics) know for South Africa where we are now in KwaZulu-Natal, it has one of the largest youth populations. The drop out rate from the time students come from matric and get into University is huge. Also, a lot of the female students drop out, especially in the field of Engineering. For KwaZulu-Natal, the biggest issue we have as a University of Technology and for the government, is unemployment as more than 50 % of the youth who finish their degrees cannot find jobs. Currently, we have students opting to get into other fields besides Engineering, even though Engineering is one of the high paying jobs,” she said. She also added that for a developing economy, what we want to do is to create jobs and to get those jobs we need to develop skills, and those skills can come through Engineering. So the quality of the programmes we offer at DUT is very important to us as a University. We believe that this (PEESA) III Meeting will help us strengthen our curricula. “However, there are also other skills that are needed, going in towards the future. There are new skills that are required in terms of data analytics, how to improve our systems and service delivery. So, we are growing fast and have many challenges but every challenge is an opportunity to grow. I really hope that through this engagement, there will be many opportunities for collaborations, especially in Engineering and for us to make a bigger impact in the quality of education,” she stressed. Also, welcoming the academics was Acting Deputy Vice-Chancellor: Teaching and Learning: Professor Theo Andrew, who added that there are gaps in the curriculum and many engineers cannot find work which tells us that there are certain skills that are lacking. “PEESA looks at the personailsed energy education which not only speaks to South Africa but to all international countries. This PEESA Project defines the life of a University by its projects and our networks that we engage in. We are eager to deal with the complexities that may exists as we are also eager to offer our Engineering courses as soon as possible at DUT,” he said. The rest of the day saw various universities deliver Engineering Course self assessment reports on curriculum evaluations and recurriculations in line with its mission to provide coherent, quality driven academic qualifications complaint with the new HEQSF. Key questions pertaining to work practices, graduation times, credits and the issue of individual windows of mobilty, were topics of discussion as well as the finalisation date for submissions on the new engineering qualifications. On day two, the academic delegates embarked on a tourism excursion in and around KwaZulu-Natal. Day Three and Day Four will tackle presentations and discussion around the developed Master programmes at various universities in South Africa. Pictured: Acting Deputy Vice-Chancellor: Teaching and Learning. 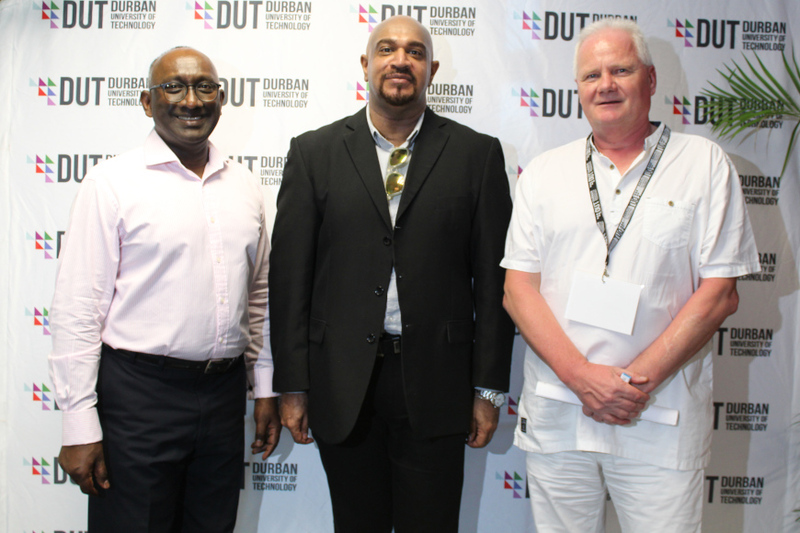 Professor Theo Andrew, Dr Lavern Samuels, Director of the International Education and Partnerships Office at DUT, and Professor Norbert Gruenwald, at the event.